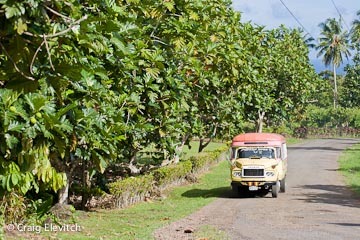 Homegarden fruit trees in Samoan village, 'Upolu. 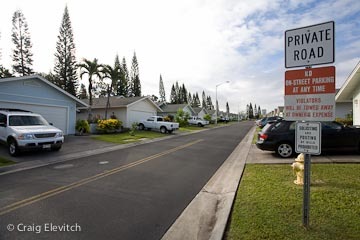 Residential area in North Kona, Hawai'i, an extreme case where fruit trees are banned by subdivision by-laws. Increasing food production in urban, periurban, and rural areas where the food is consumed, avoiding reliance on the fossil-fuel dependent distribution systems. Reallocating some of the fertilizer, pest management, fuel, and labor resources that are currently consumed in ornamental landscapes to growing food. Providing opportunities to supply small, local farmers markets with produce. Expanding opportunities for value-added cottage industries such as preserves, baked goods, fermented products, and other specialty items. Despite Hawai'i's geographic isolation and currently high dependence on imported food, its environment makes it especially well suited for year-round food production. Prior to European contact, hundreds of thousands of Hawaiians produced all of their own food without importing natural resources. After European contact, indigenous food producing landscapes around homes and in community spaces were replaced with Western-style, ornamental landscapes. For example, in a study of 150 Honolulu homes by Ikagawa in 1994, of the 42 most common plants, only four were food plants and the rest were ornamentals—this observation is mirrored in periurban and rural home landscapes. The project has two main components. First, it will produce a manual covering fruit and nut trees for environmental and landscape services such as shade, windbreak, erosion control, and noise barriers; important traditional Pacific island crops that thrive in Hawai'i; tropical perennial leafy vegetables for hedges and groundcovers; small-scale enterprise development and value-added processing based on perennial food plants; water conservation techniques; soil fertility maintenance using locally available resources; and alternatives to toxic herbicides. Second, the manual will form the core curriculum for five workshops to be presented throughout the Hawaiian Islands. The workshops include both classroom-style presentations and field tours of home and community gardens and small commercial farms. In addition, the project will publish a marketing/information kit for landscapers and government agencies to use in promoting appropriate perennial food plants, as well as a policy brief for policymakers to inform them of the benefits of community-based food security. Dr. Theodore Radovich, Assistant Specialist, University of Hawai‘i at Mānoa, O‘ahu. Ted's scientific interests lie within ecology, yield and quality of food crops. He frequently presents talks on agricultural sustainability, certified organic production, agricultural system management and related topics. He is the coordinator of the Organic Agriculture Extension Program at UH Manoa. Deborah Ward, Quality Control Officer, Hawai‘i Organic Farmers Association, Hawai‘i. Deborah is a horticulturist with over 50 years of experience in subtropical agricultural systems. She has has worked for ten years with the Hawaii Organic Farmers Association and is knowledgeable about organic standards and practices. Deborah has a four acre sustainable organic fruit garden, which provides food for family, neighbors and community and supplements her income through sales at the Volcano farmer's' market. Gerry Ross, Co-owner, Kupa‘a Farms, Maui. Gerry is a former Earth systems scientist for the Canadian government. He is currently co-owner and farmer with Janet Simpson of Kupa'a Farms, an organic farm that raises a diversity of fruit, vegetables, award-winning coffee, and beautiful soil in Kula, Maui. Paul Massey, President/Director, Regenerations Botanical Garden, Kaua‘i. Paul focuses on developing community-based conservation of plant diversity. He manages Kaua`i Community Seed Bank in Kapa`a, Regenerations Seed Garden in Kalihiwai, and co-produces Kaua`i’s biannual seed & plant exchanges. Paul also coordinates the Sustainable Gardening and Farming Training Course at Kaua`i Community College, and co-hosts "Back to the Garden", a weekly talk-radio show on KKCR (Kaua`i Community Radio). Colleen Carroll, Director, NatureTalks, Kaua‘i. Colleen has applied social research skills to urban and community forestry issues over the past 20 years. She has created school garden guides for teachers and an ebook that showcases urban greening projects that address problems such as pollution, crime, food shortage, and community disintegration. She is currently exploring community garden, backyard and local agriculture in Hawai'i. Craig Elevitch has worked in agroforestry design, management, and education since 1993. His publications include Agroforestry Guides for Pacific Islands (2000), Traditional Trees of Pacific Islands: Their Culture, Environment, and Use (2006), Pathways to Abundant Gardens: A Pictorial Guide to Successful Organic Growing (2007), and Specialty Crops for Pacific Islands (2011). The project is funded by the USDA Western Region Sustainable Agriculture Research and Education program. Opportunities for co-sponsors are available.